Highly appreciated by holidaymakers looking to change their habits for their stay, we will talk about unusual accommodations in France, attracting more tourists every year. Who would not be tempted to spend a night in an unusual accommodation in France for a touch of originality? “Glamping” is an Anglicism crossing “glamor” and “camping”. It refers to a type of unusual tourist accommodation in nature with both comfort and respect for the environment. Whether a cabin, a yurt, a tent on stilts, a trailer or a farm, here are ideas for relaxing nights in unusual accommodation in France. You will find a lot on the internet simply by searching under the word “glamping”! This night in unusual accommodation in France in a very natural setting will take you out of your usual lifestyle. Nature will recharge your batteries so have fun with a little weekend glamping! Because of course the glamor glamor is also sometimes offer spa, massage and jacuzzi in the wild. NB: glamping usually costs between 100 and 300 euros a night. Here are some unusual! Of course, the first use of a lighthouse is to orient the boats arriving at the harbor at night, but they can also be sometimes a good place for an atypical night. Live this present moment fully between heaven and earth, closer to the clouds. With more than 30 meters high, you will love the 360 ​​° panoramic view. NB: Lighthouses in unusual accommodation are mainly on the French coast “Bretagne”, such as the Kerbel lighthouse in Riantec. Count around 600 euros per night and 3000 euros the week. The castles are places steeped in history, some dating back to the Middle Ages. Many guest rooms offer rental rooms in castles. If you are passionate about history or just want a moment that does not look like another, choose this unusual accommodation. NB: the Loire is well known for its many castles: the Château de la Bourdaisière, the Château de Marçay and the Château de Verrières. Count between 100 and 250 euros per night. Normally sleeping on the water is not part of your daily life! So if you do not have seasickness, sleeping in one of the houseboats completely transformed into apartments should seduce you. The water and natural surroundings around the houseboat will re-energize the freshwater sailor in you! NB: Without a boat license, you reserve a barge, which will remain at the dock, between 100 and 150 euro. With boat license, why not rent a houseboat to go around the Mediterranean with your loved ones between 2000 and 4000 euros per week? Do you need a change of scenery, escape, rest, being in a bubble? The outdoor bubble is for you. 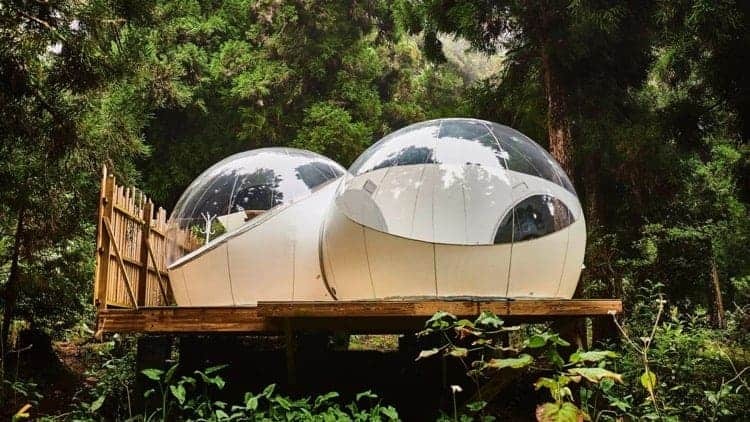 Immersion in the heart of nature, in a transparent bubble, surrounded by 360 ° of greenery, you will have the feeling to be in direct contact with nature. It’s like a night under the stars without mosquito and without getting cold! You will fall asleep under the stars with the moon and trees for only benevolent companionship. The light of day will wake you naturally after your night in this unusual accommodation. NB: Example with labulleetoilee.fr for a bubble in Normandy from 130 euros per night. Or with bubblesdesbois.fr for a bubble in the forest in the PACA region at 200 euros per night. Enjoy your unusual holidays, dear Fuzzy! Travel fans? Interested in Scotland?